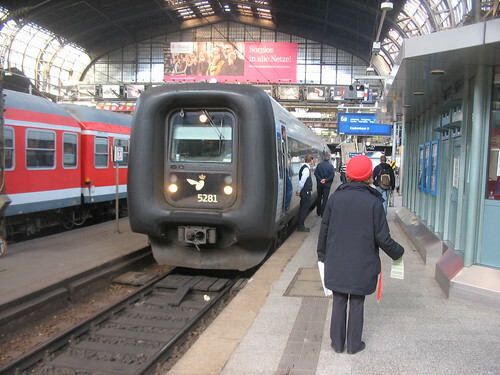 The “Bird-flight line” between Germany and Denmark uses one of the last passenger train ferry services in Europe, providing a direct route from Hamburg to Copenhagen “as the bird flies”. There’s no way the ticket machine is going to be able to cope with this, I thought, giving it a go anyway. What hope is there of getting a foreign machine to sell a future-dated ticket for a cross-border trip, on a service which is partly reservation-only, includes a ferry, and calls at a station which doesn’t exist – in the middle of the sea? With a break of journey in the next country. Oh, and a foreign credit card. But Deutsche Bahn’s latest technology beats the our old Quickfares, and a couple of minutes later I was leaving Lübeck station clutching enough paper to keep the forest products industry in business for the next week; the ticket, two reservations, a receipt and a list of timings. All issued in English, and after offering me timetable information and a choice of fare options. Back in September 2007 I’d got an invitation to the opening of a new bit of metro line in Denmark, and having some holiday to use up I thought I’d take a route which was a bit more scenic than a tin box direct from Gatwick to København. The Danish and German governments had recently agreed to build a bridge across the Baltic to replace the current Fehmarn Belt train ferry, so this seemed a good opportunity to sample the sea crossing – not that there is too much of a rush, as the bridge won’t open until 2018, if it happens at all. Step one was getting to Germany. Eurostar hasn’t really caught on to one-way trips, and while DB’s whizzo ticket machines might be wonderful their sleeper train website was sulking, so a search online found me a “how do they maintain the planes at that price?” flight to Bremen with everyone’s favourite Irish airline, leaving darkest Essex the next day. A mere 15 min after landing in Bremen I was on the tram stop outside the air terminal. Just 20 min after landing I was back in the airport seeking somewhere to buy a ticket, and only 25 min after landing I was on a tram to the Hauptbahnhof. From here I caught a couple of double-deck trains via Hamburg Hauptbahnhof to the strangely deserted city of Lübeck, and its handily central youth hostel – staying in Lübeck meant the next morning’s departure time would be at a more civilised hour than if I joined the København train at its start point in Hamburg. 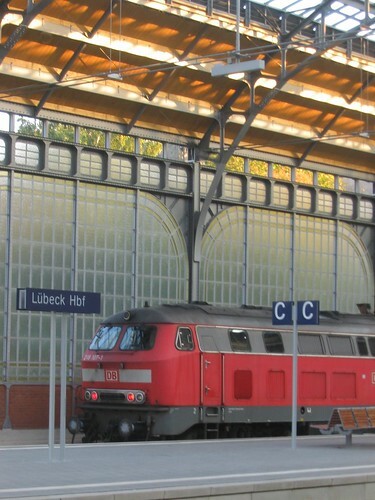 The railway from Hamburg to Lübeck is currently being electrified – by the time you read this, it probably will have been – which will bring the demise of the “rabbit-ear” exhaust Class 218 diesel locos which currently power double-deck push-pull trains on the route. 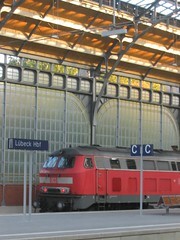 On a previous visit in March 2007 the station had been a building site, but by September the overall roof had been completed, and the heavily-rebuilt station had a modern and efficient air about it. I’d seen the Hanseatic city’s sights before, so it was time for a meal, ein bier, and bed. Thanks to the wonderful ticket machine I was already booked on the next day’s 08:07 train to Denmark. In September the Hamburg to København service was operated with Danish State Railways’ IC3 DMUs, three-cars units with “rubber ring” ends (and not to be confused with the German ICE3 high speed trains). Built by ABB Scania before it became Adtranz and then Bombardier, the 180 km/h units aren’t the prettiest things on rails, but the spacious interior makes the most of a loading gauge somewhat larger than ours. With the December 2007 timetable change DB’s ICE-TD tilting inter-city DMUs have been transferred to the route, the national railway finally having found a home for what have provided troublesome trainsets (one got dropped and bent in a depot accident, like the unfortunate Hull Trains Pioneer DEMU). Reservations are compulsory on the German leg of the trip to Denmark, but my seat was firmly occupied so I bagged a spare seat across the aisle; after a few seconds of the “music” from a fellow passenger’s headphones I decamped to the next carriage. We left Lübeck slightly late, and headed north for an uneventful 89 km trip across a flat and nondescript landscape. The final stretch of this line was built specifically for international trains, as part of a grand plan to significantly shorten the time needed to travel between eastern Denmark and Germany. By the early twentieth century it had become clear that better links were needed between København and Germany. One of the travel options was to take a train to the Danish port of Gedser, then make a long sea crossing to Warnemünde on the north German coast. 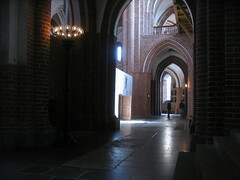 The alternative was to take a train across Sjælland (Zealand) from København to the Storebælt (Great Belt). Here you caught a ferry across the strait to the next island, Fyn, which was then crossed by train until you hit the Lillebælt (Little Belt). 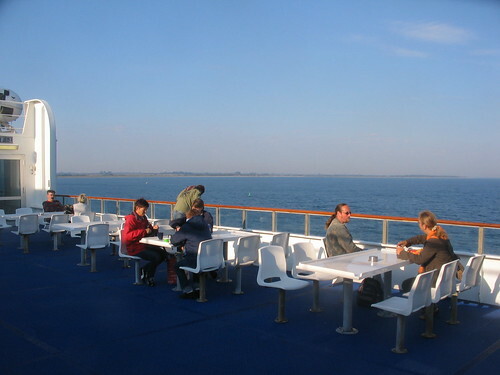 A second ferry then took you on to the Jylland (Jutland) peninsular, from where you could get a train south to Germany. A bridge across the Lillebælt was opened in 1935, permitting a through rail journey once you were west of the Storebælt, but that still had to be crossed by ferry and it was all a bit of a long way round. By the end of the 1930s plans had been firmed up for new link, which would use a relatively short sea crossing between the Danish island of Lolland and its German opposite number Fehmarn. New bridges would link each island to the respective national road and rail networks. Joining together the islands dotting the shortest route across the Baltic, this route is in effect a straight line between Hamburg and København, and could even be stretched, with some cartographic licence, on to Stockholm and Köln. The proposed route became known as the Vogelfluglinie in German or Fugleflucts Linien in Danish, meaning Bird Flight Line, in the sense of “as the crow flies”. This sometimes gets translated into English as the “Bee Line”. The first step was the opening of the 3.2 km Storstrøm bridge in 1937, providing a road and rail link between Sjælland and the island of Falster, but further progress was interrupted by the outbreak of war. The plans were dusted off again after the German occupation of Denmark, and in 1941 the Danish parliament agreed to construct the rail and motorway links for their end of the scheme. Work began immediately, and about 13 km of civil works were completed at a cost of 7.7m krone before being put aside for another day in the face of more pressing matters. Peace created a problem for the long eastern sea route from Gedser to Germany. The ports of Warnemünde and Sassnitz were now in East Germany, and transit to the areas under the control of the western powers was no longer possible. 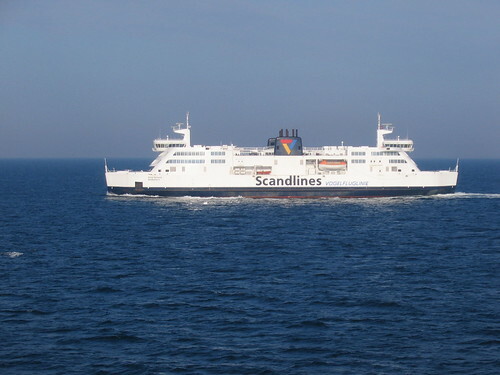 Traffic from Scandinavia to western Europe had to go round via Jylland, and the Storebælt ferries couldn’t cope with demand. To keep things moving a temporary ferry service was introduced on 14 July 1951, running from Gedser to a new facility built at Grossenbrode in what was now West Germany. By 1958 West Germany had recovered to the extent that it was in a position to take another look at the plans for the Bird Flight Line, and a new Danish act of parliament approved the re-start of work on a revised scheme. At the German end the railway from Lübeck to Grossenbrode was resignalled and upgraded for higher speeds, while 18 km of new line was built to a new ferry port at Puttgarden on the island of Fehmarn. The railway crosses from the mainland on a 960 m bridge, which includes a 250 m arched main span taking the single track line and a parallel road 23 m above sea level. Work on the bridge began in January 1960, and it opened in April 30 1963, with the island’s ferry service closing the same day. 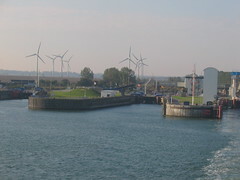 A second ferry port was built at Rødbyhavn, near the town of Rødby on the Danish island of Lolland. A meandering private railway already ran there, but the new terminal was linked to the Danish State Railways (DSB) network with the construction of a line running for 37 km straight across the island. A swing bridge carried the new line above the Goldberg sound and on to the neighbouring island of Falster. At Nykøbing it joined up with the railway to Gedser, the port for the temporary service to West Germany which the Bee Line would replace. The new line was built without level crossings, instead needing numerous bridges because of the flat landscape. 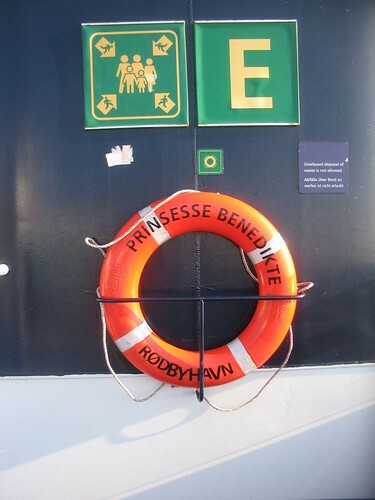 The German and Danish ferry ports were just 18 km apart by sea, a substantial saving on the previous 69 km route from Gedser to Grossenbrode. This cut a København – Hamburg trip to just 6 h 15min, compared with 9h 20min via the Great Belt or 8 h via Gedser and Grossenbrode. It now takes about 4½h. 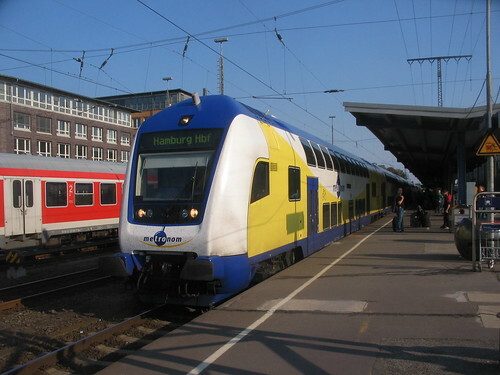 The Bird Flight Line service was inaugurated on May 13 1963, using DB ship Deutschland and DSB ship Kong Frederik IX, which were transferred from the temporary Grossenbrode to Gedser route. Also transferred was Theodor Heuss, which had entered service on November 1957. The route proved a success, and traffic continues to grow. 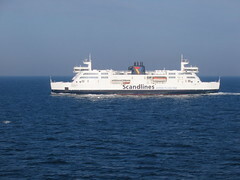 Modern ferries operated by Scandlines now leave each port every half hour around the clock, and are timetabled to take 45 min for the crossing. 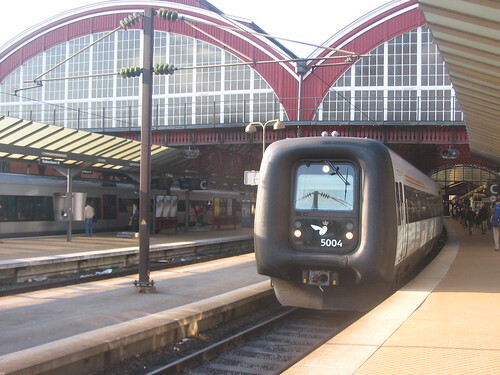 Not every sailing carries a train – there are six Hamburg – København train pairs a day. In June 2007 the Danish and German governments finally agreed to build a 19 km bridge to replace the ferries. Work is planned to start in 2011 and the bridge is scheduled to open in 2018, but this is dependent on Denmark stumping up the money; the Germans have said that if the Danes want a bridge they will happily go along with it, but they won’t pay for it. The train stopped briefly in the station at Puttgarden, before running forward into the bowels of the ship quite simply and unexcitingly, at least from the passengers’ point of view. The train doors opened, and passengers started to wander off; it was obvious that I wasn’t the only one who was unsure as to whether he could his bag on the train. 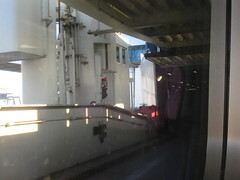 The train parks on the car deck, with a lorry behind it, and passengers mingle with road users as they head upstairs to the lounges. Forget romantic notions of chaps in horned helmets [yes, yes, I know] taking to the high seas in this part of the world. Built in Denmark in 1997, Prinsesse Benedikte is a sort of floating motorway service station, with bars, a closed restaurant and a dedicated lounge for lorry drivers. The duty free shops were closed, perhaps permanently. Having walked round the ship in both directions I headed to the buffet, joining the locals in a game of seeing how much hot coffee it is possible to get into a serve-yourself paper cup without burning yourself. Up on the inappropriately-named sun deck passengers were watching the busy maritime traffic of this corner of the Baltic. There are ships visible in every direction, but also lurking out here amongst the waves is an honorary railway station, Puttgard MS. A figment of the ticketing system, the notional Mittlesea station allows holders of tickets for one country to buy a ticket for the other country, starting right at the international border. Arrival in Denmark is as unexciting as the departure from Germany, the ferry slowing past the breakwaters as it enters Rødbyhavn. To save time at the ports the ships are double-ended, with a bridge and doors at both ends so there is no need to turn vessels round. 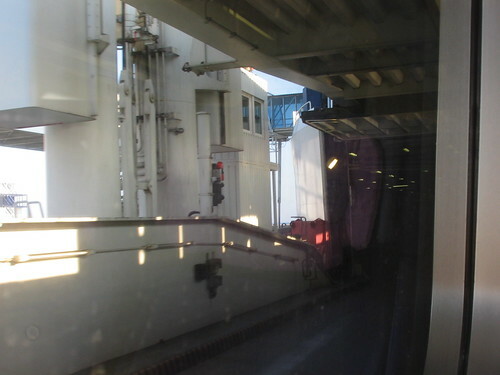 There was an obvious movement of passengers towards the car deck as we approached Danish terra firma. The train is the first vehicle off the ship when the doors open, passing through a vast area of derelict sidings left over from the days when borders were real borders. The station was built for 15-coach loco hauled trains, rather than today’s three car DMUs, and yard tracks were laid out so that a complete ferry load of wagons could be in position and waiting to be shunted on board as soon as the ferries docked. All rail freight traffic now goes round via the Storebælt and Jylland, with the Øresund bridge as newest link in a chain which enables freight to be hauled from Sweden to through to Germany with just one multi-voltage loco. The scenery continues to be unexciting, with minor interest provided by the bridges between the islands. The Guldborg Sound between Lolland and Falster is crossed on a precast concrete bridge, actually two parallel structures, one for the single track railway and one (which is itself two interlinked structures) carrying the road. Trains are now back on the original line to Gedser, and cross to Sjælland on the 3.2 km road and rail Storstrøm bridge built in 1937. At Ringsted we join the main line from Jylland to København, and not long after we pull into the ancient ecclesiastical capital Roskilde, where there is an impressive cathedral. The past few centuries worth of Danish monarchs are buried here in neat numerical order, including the railway enthusiast Frederik IX whose final journey to the cathedral in 1972 was steam-hauled; his wife left instructions to use the same locos for her own funeral in 2000. 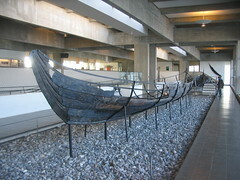 The sea crossing on the Bird Flight Line is efficiently dull, but the glory days of Danish maritime matters can be recreated at a museum by down the shore in Roskilde. Five Viking ships when been extracted from the seabed and put on display, and replicas take people out into the fjord to experience a bit of Viking life (note to museum curators: I’m sure the Vikings were all into trade and poetry, but I want longships and pillage for my krone). The ride onwards to København on an EMU packed with school children was uneventful, and no-one even asked to see my heap of tickets. 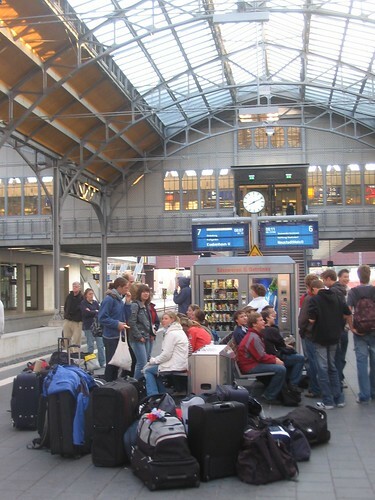 This entry was posted in Railways, Travel and tagged Denmark, ferry, Germany. Bookmark the permalink. Andrew Grantham's home page, with a collection of various articles, mainly about railways. There are subsites about railways in Afghanistan and railways of Iraq, and one about sound mirrors, strange lumps of concrete on the British coast.